A two-day workshop on ‘Computational Physics using MATLAB and GNU Octave (WCP 2018)’ was organized by the Department of Physics on 26 – 27 October 2018. The purpose of this workshop was to enable the participants to implement numerical analysis to solve problems in physics for which a quantitative theory already exists. The software tools used for the same were MATLAB (which is a paid software) and GNU Octave (which is a free and open-sourced software). The participants were provided with hands-on experience of developing software code on Linux workstations for various physical problems, apart from talks on various topics in the field by eminent resource persons. 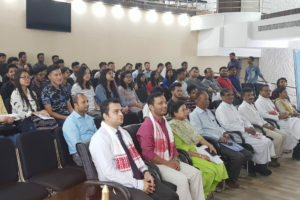 The chief guest at the inaugural session, Prof Madhurjya P. Bora, Head of the Department of Physics, Gauhati University stressed upon the importance of Computational Physics and the need for free and open-source software in today’s world in his inaugural address. The convener for WCP 2018, Mr Parag Bhattacharya from the Department of Physics, DBU, then presented an overview of the programme for the workshop. The first session of the workshop comprised of two talks. 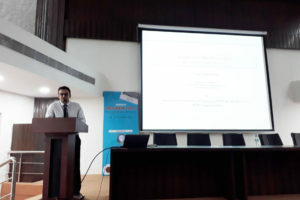 The first talk, titled Computational Physics: An Introduction, was delivered by Prof Madhurjya P Bora. Prof Bora illuminated the auditorium with numerous illustrations and live demonstrations on the subject, thereby setting the stage and context for the workshop. This was followed by another talk, titled Introduction to Numerical Methods, which was delivered by Mr Parag Bhattacharya, Asst. Professor in the Department of Physics, DBU. In his talk, Mr Bhattacharya introduced the participants to some of the commonly used numerical methods used in Physics. 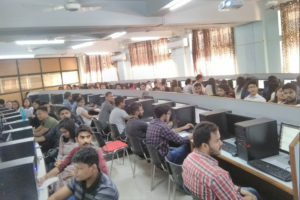 The remaining sessions for the first day were continued in the Computer Lab. Each participant was provided with a PC running Ubuntu 16.04 LTS. The participants were introduced to the softwares, i.e. MATLAB and GNU Octave, by Mr Parag Bhattacharya. They were provided with the time to explore the GNU Octave IDE, and were familiarised with the basic elements of the computational software: matrices, scripts, iterations and functions. The first session of the second day began with a talk, titled Monte Carlo Simulations, which was delivered by Dr Samrat Dey at the Crystal Hall. 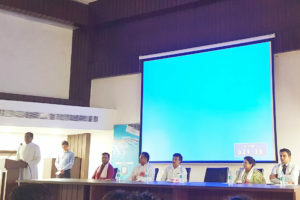 This was followed by continuation of the hands-on sessions in the Computer Lab, wherein the participants were given step-by-step demonstrations on solving physical problems using MATLAB and GNU Octave. The participants were also provided with a set of eBooks and lecture notes for the entire workshop for future reference. Even though the workshop was intended mainly for Physics students, it was also open to interested participants from the branches of Chemistry, Mathematics and Engineering. 64 participants from different universities in Assam and Meghalaya participated in the workshop.